The ASP Dagupan City Chapter headed by Dra Christina Broncano, ASP Dagupan Chapter President conducted a special cake decoration workshop for children with autism in celebration of the 16th National Autism Consciousness Week at the 3rd floor of Oakridge International School, Dagupan City in partnership with Disenyo Customized Cakes and Pastries last 26 February 2012. The said event provided an opportunity for children with autism to learn some basic knowledge and skills on baking. It also served as an avenue to get to know new members and at the same time promote camaraderie among children with autism and their families. The activity was participated by 14 parents, 2 professionals and 18 children with autism together with the following officers: Ms. Mae Acedo – Treasurer, Ms. Margot Matias – Assistant Treasurer, Ms. Aida Soriano – Board Member and the writer. 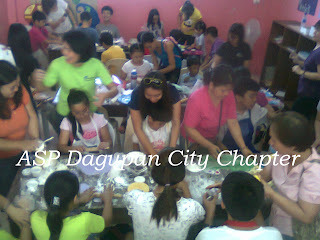 To know more of ASP Dagupan Chapter's activities, you may get in touch with Dra. Christina Broncano, Chapter President at (0905) 330-9194.